Every week there is a new announcement of “How transmedia storytelling is changing TV” . This week it is parallel TV and web contests on Bravo’s Top Chef. Entertainment is a risky business, so anything that makes money or attracts attention becomes the basis of the next pitch and the next big investment. After the success of Lost in spreading fan involvement from the TV screen to the web in the form of intense plot speculation, map-making, webisodes, and games, “transmedia storytelling” — whose properties have been brilliantly observed by my old friend and colleague Henry Jenkins of USC — became the goal of many producers. I agree with Henry that the creation of a consistent story world with participatory elements that takes viewers deeper into the fictional universe is a phenomenon that is very much worth taking note of. But I am also impatient with the concept, because I don’t expect “transmedia” anything to be around very long. Why am I so sure? Because “transmedia” like “photoplay” is an additive term for a temporary, additive practice. Just as we no longer think of movies as merely photographed plays, we will someday cease to think of television and the web as separate media platforms for authors to work across. As Nicholas Negroponte used to say, “Bits are bits.” Anything translated into binary integers is part of the same medium – the digital medium. And once an entertainment property is in the digital medium, all of the expressive possibilities of that medium become available to it. Digital representation is not limited to sending legacy media packages down a new kind of wire: it is not merely a transmission technology. The digital medium is a new form of representation, opening up new possibilities of interaction and immersion, and the possibility of wholly new genres of entertainment that transcend their patchwork origin, just as movies transcended the patchwork of photography plus live theater to find their own expressive language. Most of my students do not own a TV – they watch on their computers. Millions of older consumers are watching TV and movies on demand on their iPads or game control systems. Some smaller number are calling up the internet on their living room Google TV sets. Right now the mating between these separate media forms is clumsy and incomplete. Additive design is not stable because it takes too high a cognitive load: if you don’t believe me, try to figure out which game events belong to the canonical Lost universe, or what to make of the characters in the Lost videogame that look enough like the characters in the TV series to make it annoying that they are not played by the original actors. How will we transcend this awkward additive “transmedia” stage ? Not by making everything on television interactive or everything on the web serialized and non-participatory. 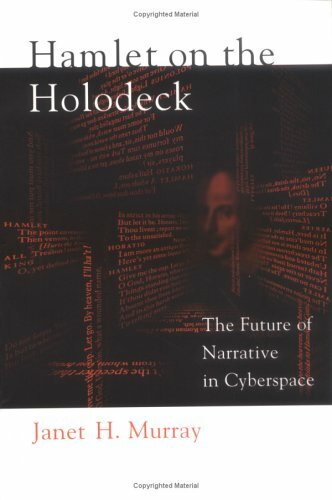 But by looking at the points of intersection of existing media genres — what we might currently think of as the “transmedia” design space – as marking off the turf of an emerging new genre which will eventually define its own space within the vast expressive affordances of the digital medium. This entry was posted in Ch 1 Design in an Evolving Medium, Design of the Unfamiliar, Interactive Narrative and tagged Lost, Top Chef, TV. Bookmark the permalink. Thank you for this website! I will be investing in your book, for certain. As a student in a Digital Media Master’s program (the MCDM at University of Washington), I’m finding it particularly surprising that there are so few women in this aspect of the industry–all of our guest lecturers in the “transmedia” storytelling vein are men, and most of the online sources are as well. Do you see that as resulting from the genesis of cross-platform storytelling having been Alternate Reality Gaming? Thanks for the comment! It’s true that Hollywood and gaming are male-dominated industries, but there are many women active in the field as well, including several other academics who write books you will want to check out. Tracy Fullerton of USC was one of the pioneers of transmedia, making some of the first tv-related games. She was the only person I saw in the early days at both the interactive TV and the Game Developers conferences. Celia Pearce is a pioneer ethnographer of online game communities. Katie Salen co-wrote one the first game design textbooks. Mary Flanagan and Camille Utterback are among the most talented and original digital installation artists, combining moving images and interactivity in works with substantial expressive power. And no one is a bigger exponent of alternate reality gaming than Jane Gonigal. So welcome to the field of digital media — this is a growing medium with lots of as yet undiscovered and unclaimed territory — offering plenty of room for more women practitioners .